Our Fall Launch month continues! 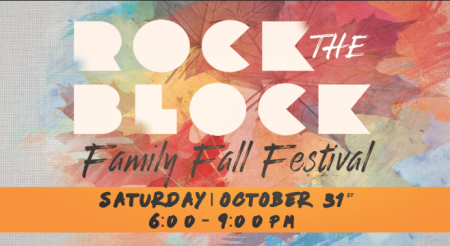 Not only have all our ministries kicked into full gear in the last two weeks but we are announcing this week our "Rock the Block" Family Fall Festival on October 31st. Sponsored by our Family Ministry (KidsWorld & ONE Student Ministry) - it’s going to be a great night of fun and games. On October 31st, we will not have our regular Saturday night service. We want to encourage our families to come out and bring your neighbors and friends to this great night of outreach. (If you normally come on Saturday night, we encourage you to come (on that October 31st weekend) on Sunday morning. Since our 10:30 a.m. and 12:00 p.m. services are full in the parking lot and auditorium, I encourage you to try out our 9:00 a.m. service - which has plenty of parking, KidsWorld space and auditorium seating. Along with other activities for the kids, that night we will also be giving out candy! 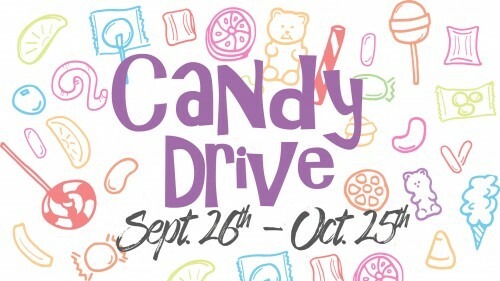 If you would like to be a part of making this night happen you can simply bring a bag of candy to any service between now and October 25th and leave it in the lobby at the Candy Drive: KidsWorld display. Afterlife continues this weekend - If you have missed the first two weekends, please check them out online here. You can also jump in this weekend. It is a powerful series about what will happen after this life. Don’t miss it. I look forward to being down at our North Miami Campus this Sunday at 10:30 a.m. and I hope to see all our ‘NoMites’. Community Groups just launched! If you have not yet joined one, there are many of them and one just for your needs, your schedule and preference of topic. You can check them out here online or pick up a brochure with each one listed in the lobby this weekend. We believe that everyone should do life with others - with over 40 adults and a dozen or more teen groups you will find one just for you. Guatemala Missions Trip is leaving this Monday morning. This trip, led by Executive Pastor Ricky and Lily Garcia our Executive Director of Leadership Development/Community, will be a first for us to this country. The Garcia family will be leading 2 Tiaras Events in two different churches and cities. Thank you to all of you who donated to the Dress Drive! They along with other Oasis’ers will also be ministering to an orphanage this week. Please pray that God will use them and remember to keep them in your prayers. P.S. To give the Lord’s tithes and your offerings and to continue to see God do great things in and through Oasis Church you can give online 24/7 or you can do so at any of our services. You now have 6 ways you are able to give back to God through Oasis Church. If you want to find out about all the ways to give, you can go to this page NOW.